Once the worry abated, I returned to doing the mockups for the KLM project. I finished them all by tuesday and sent them off to Kars to show to KLM. Then I caught up on daily comics, and went for a swim with my pal Lowen. Wednesday evening I went to a concert at Paradiso, and after that I honestly can’t remember what I did until friday, when I went to Amsterdam for the Hackastory hackathon. I was well-aquainted with the concept of gamejams and hackathons, but what would happen when the goal was to create an interesting form of storytelling, and there were journalists and such participating, I didn’t know what to expect. But things turned out great. There were some concepts floating around to get started, and you could form your own team based on common interest for a particular idea, so pretty quickly I ended up in a team with Lotte Belice from Beeld&Geluid, architect/designer Bart van Lieshout and Andre Goncalves, a programmer who also works in the Dutch Game Garden at INTK. Our idea was to create a website/webapp that would let you explore news stories in a non-linear way. Our shared frustration came from having to scan through entire articles to get to the bits you were interested in, and a lack of context to the stories. 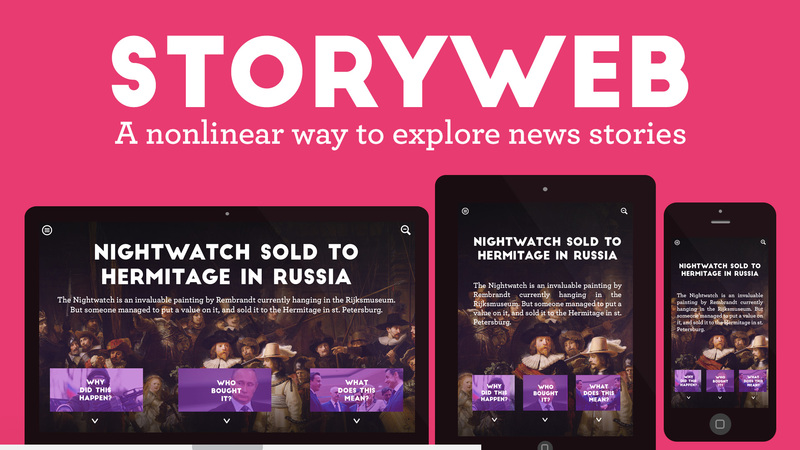 So we created Storyweb, a network of nodes with nuggets not much bigger than a tweet, which together form a complete picture of a story, and you can explore them in any direction you like. The nodes are connected by questions, kind of in a choose-your-own-adventure kind of way. You can follow the thread that you find most interesting. It’s not unlike a wikipedia binge in that way. We came up with a fictional story to demonstrate the concept, and you can try the webapp for yourself over here. I mostly worked to hash out the interaction design and then helped Andre put it together. We were pretty proud of what we managed to do in two days, and the other teams had great ideas to that you can check on via the Hackastory blog. It was an inspiring weekend and I met a bunch of cool people. A+ would hack again. Well done Albertine, Nienke and Emiel. Since there wasn’t much going on the past week professionally I bring you my experiences with The Forest, a new sandbox survival horror game that I’ve been excited for since the first trailer, and which just hit Early Access on Steam. It’s a super rough Alpha and a lot of things don’t work yet (like the essential saving of progress, so whatever you do now is kinda pointless), but the allure is undeniable. With the survival options at your disposal this could become a really cool game. I crawl out of the plane wreckage. Beams of sunlight shine through the trees around me, illuminating the seats and luggage scattered in the clearing. Rabbits hop around between the wreckage. I’m lucky to be alive. On my way out I pull a small axe out of the chest of a stewardess, and use it to break open some of the suitcases, looking for food and anything I can use. I then swing it at a large iguana crawling up the trunk of a nearby tree. I won’t die of starvation. Then something else rustles in The Forest. I look around the treeline. Large grey humanoid shapes emerge from the brush. I run. The island is lush, packed with vegetation and wildlife, I can see a lot of options for surviving out here. I even spy a snowy mountain peak in the distance. So I decide to put my axe to use and build a little hunting shelter to sit under. A nice glen nearby, next to a pond, provides the perfect spot to put something together. While I chop down my first tree I wonder if this is maybe too close to the plane wreckage. My fears are confirmed when I hear something rustle in the tree next to the one I just chopped down. I look over, and a deformed man in white war paint jumps on my head. No wait, that’s not how it goes. I crawl out of the plane wreckage. Large grey humanoid shapes emerge from the brush. I run. After a few minutes I reach the coastline. A large cannibal lies next to an abandoned tent with a spear in his back. His head is propped up on a stick in the sand next to his body. I decide this is a fine place to start a new shelter. I flip through my survival handbook and decide to go for a log cabin (go big or go home). This should provide me shelter from any cannibal mans. I begin chopping down trees around the beach. I need 88 logs to build the log cabin. An average tree can supply me with three or four. Christ, this is gonna take a while. I work into the night, when it starts to rain and making a fire seems like a good idea. It is quick work and I can roast the iguana on it. When I’ve finished eating, I wonder for a moment if this fire isn’t going to attract the wrong kind of attention. I look up and see three cannibals standing next to the foundation of my cabin. Fear-stricken, I scramble down the beach into the dark, hoping they didn’t see me. They didn’t. But they seem like they’re tracking me. Slowly they make their way down the beach, and I prepare myself from a bloody and most likely deadly fight. Then a horn sounds, and the cannibals run back into the woods. Carefully I return, and continue chopping down trees. By daybreak I manage to have about 25 logs set up. I do a spot of fishing and dilligently continue my work. Without having to worry about hulking monster men constantly I make good progress. I only need about 30 more logs now. Night falls again. With each chop of the axe I do a perimiter check, but so far so good. Then three hunting parties move through the forest. Under the cover of a thunderstorm I retreat down the beach again, and start a second fire to stay warm and maybe lure them away from my cabin-to-be. This diversion seems to be working, and I circle back through the woods to my cabin to continue construction. When I pick up a leftover log I see a small grey figure standing in the bushes. A female cannibal, looks like a scout, is standing there, staring at me. Then she turns and runs away. I put the log away and pull out my axe. More figures approach. The hunting parties have returned. Stumbling backwards over the rocks I climb up a cliff, pursued by the female scout. I’m not sure if she can see me, I think she might be tracking me by sound and smell. When I reach the other side of the cliff I roll in some mud in the hopes that will throw her off, but she’s always a few steps behind me, with what looks like a fire shaman in tow. On this side of the cliff I find a shipwreck, its contents scattered across the beach. I consider swimming out to the wreck but I’m in bad shape as it is, shivering and out of breath. I try to retreat further but the beach is surrounded by hunting parties on all side. “This is it”, I think, and I charge at the female scout. She knocks me over the head with a tomahawk. I wake up in a dark cave. Dead passangers from the plane are strung up from the stalactites. I thought I was dead but perhaps this fate is even worse. With the dim light of my lighter I creep around the cave system to find the exit, gathering some much-needed supplies on the way. I manage to escape without incident and rae back to the beach to finish my cabin. Only 10 more logs. I hack and hack and hack away with my new-found larger axe. Dusk creeps up on me. Before I know it I am slithering through the brush again, hiding from more cannibal patrols. Only four more logs! I will not be defeated! The comfort of the cabin’s interior is a massive relief, even though it provides little protection if the cannibals were dead set on getting to me. Against my better judgement I build a fire pit, which does attract the cannibal patrols, but the just hiss and claw at the outside of my stronghold. Tonight, I’ve won. When morning comes I step out of my abode like I was living in the english countryside, and gaze upon my construction shimmering in the early morning light. A rainbow is visible overhead. It’s hard to imagine I fought off waves of bloodthirsty mutants here several nights before. I have a fighting chance now. The reality that I cannot salvage this progress sets in. I sit in my cabin for a while longer, then walk outside and fire a flare into a cannibal patrol sneaking through the forest. Got into Twine today to write and map out the story for the next game I’m working on and it’s been a delightful experience, very easy to write branching dialogue and test it right away, plus it’s similar to Playmaker, so implementation in Unity will be a breeze. I look up from my laptop screen at the sound of a faint crackle. The iron resting on the end of the ironing board next to me hisses gently. It reminds me of a chubby contented cat, even though I’ve never owned one, and admittedly spent a far too small percentage of my life not being in the company of one. The iron prattles some more and I wonder if I should unplug it. I finished ironing my laundry almost 15 minutes ago, it’s all been stowed away already, but somewhere on the way to put away the ironing board I veered slightly to the right and ended up by my laptop, which was spitting out semi-melancholical songs from people I feel like I know better than I actually do. Maybe it was to check if that girl I like and have been talking to for two weeks now but have zero idea of how she feels and where things are going other than it’s fun right now and I like talking to her but I don’t want to push my luck is online and oh yeah she is but I won’t talk to her now maybe tomorrow. Another fizz. I consider getting up to pull the plug out but I kind of enjoy the warm air it is pumping into the room.